It’s a pleasure to be in Bradford today to launch Labour’s manifesto, “For the many not the few”. I’m pleased to be here in Bradford University where that great Labour Prime Minister Harold Wilson was the first Chancellor. Harold Wilson had a vision for Britain and created the institutions to match, like the Open University. Today we set out vision to transform Britain for the 21st century. This manifesto is the first draft of a better future for the people of our country. A blueprint of what Britain could be and a pledge of the difference a Labour government can make. Like thousands of other Labour party members, I’ve been making that case to people across the country over the last few weeks. As this campaign has continued, for an election called by a Prime Minister with scant regard for her own solemn pledges, opinion has started to move towards Labour. There is no great secret as to the reason. People want a country run for the many not the few. They have benefitted from tax cuts and bumper salaries while millions have struggled. Whatever your age or situation, people are under pressure, struggling to make ends meet. Our manifesto is for you. Parents worrying about the prospects for their children and anxious about the growing needs of their own elderly parents. Young people struggling to find a secure job and despairing of ever getting a home of their own. Children growing up in poverty. Students leaving college burdened with debt. Workers who have gone years without a real pay rise coping with stretched family budgets. Labour’s mission, over the next five years, is to change all that. Our manifesto spells out how. With a programme that is radical and responsible. A programme that will reverse our national priorities to put the interests of the many first. Will change our country while managing within our means. And will lead us through Brexit while putting the preservation of jobs first. Let me highlight just a few of our key pledges, and believe it or not, you haven’t read them all already. We are ruling out rises on VAT and National Insurance and on income tax for all but the richest 5% of high earners. Labour will boost the wages of 5.7 million people earning less than the living wage to £10 an hour by 2020. Labour will move towards universal childcare expanding free provision for 2, 3 and 4 year olds in the next Parliament. 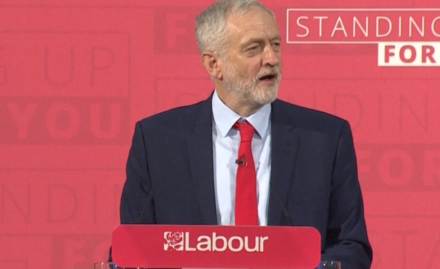 Labour is guaranteeing the triple lock to protect pensioners’ incomes. And we will build over a million new homes, at least half for social rent. Labour makes no apology for offering new protections to people at work, including ending the scandal of zero-hour contracts. Or for finding the resources to hire 10,000 new police officers and 3,000 new firefighters. And we will do the smaller things that still make a real difference – like ending hospital car parking charges or introducing four extra bank holidays a year. But we in Labour recognise that solving these problems requires a thriving economy. One that gets our economy working again, and rises to the challenges of Brexit for jobs and investment. For seven years the Conservatives have been holding Britain back. Low investment, low wages, low growth. Labour will move Britain forward with ambitious plans to unlock the country’s potential. Labour will set up a National Investment Bank and regional development banks to finance growth and good jobs in all parts of the UK through major capital projects. Labour will invest in our young people through a National Education Service focussed on childcare, schools and skills, giving them the capacity to make a productive contribution to tomorrow’s economy. Labour will take our railways back into public ownership, to put the passenger first. We will take back control of our country’s water by bringing it into regional public ownership. And we will take a public stake in the energy sector to help keep fuel prices down and ensure a balanced and green energy policy for the future. The Tories now want to scare us into accepting more of the same. Only Labour has a plan ambitious enough to unleash the country’s potential. And only Labour has a plan to make Brexit work for ordinary people. We are clear: The choice is now a Labour Brexit that puts jobs first, or a Tory Brexit that will be geared to the interests of the City, and will risk making Britain a low-wage tax haven. As we leave the European Union, because that is what the people have voted for, only Labour will negotiate a deal that preserves jobs and access to the single market, preserves rights and does not plunge our country into a race to the bottom. All this is costed, as the documents accompanying our manifesto make clear. Our revenue-raising plans ensure we can embark on this ambitious programme without jeopardising our national finances. We are asking the better-off and the big corporations to pay a little bit more – and, of course, to stop dodging their tax obligations in the first place. And in the longer term we look to a faster rate of growth, driven by increased private and public investment, to keep our accounts in shape. This is a programme of hope. What would another 5 years of Conservative government mean for Britain? Fewer young couples able to buy their first home. More people queuing at food banks. Fewer police on the beat … fewer firefighters too. More people are in work but they’re not getting the pay or the hours to make ends meet. More young people are in debt. Will the Tories change their spots? Don’t bank on it. Their record says they wont. Theresa May will disagree of course. So I say to her today: Prime Minister, come out of hiding and let’s have that debate on television so millions can make up their minds. They will decide that Britain has been held back by the Tories. That the few have prevailed over the many for too long. And that they will decide it is now time for Labour. Our country will only work for the many not the few if opportunity is in the hands of the many. So our manifesto is a plan for everyone to have a fair chance to get on in life, because our country will only succeed when everyone succeeds.